It's my 1st Blogversary! - Stop staring and start sewing! It's been one year since my first post and what a wonderful year it has been! I was a little worried that people would think I was bossy when they first read "Stop Staring and Start Sewing" at the top of the page. I really just wanted to encourage people (in a bossy sort of way) to actually try some of the fun things we all see when we are surfing through all those great craft blogs out there. I'm amazed at all the talented and fun friends I've made and I'm thrilled with all the notes I've gotten from gals who have actually decided to stop staring and start sewing (you "get it")! I'm having a fun little give-away (I love these!) to celebrate. Just leave a comment in the form of a haiku (just kidding! Any old comment will do), and I will run it through that random number site later this week to pick a lucky winner. Here's the prize! 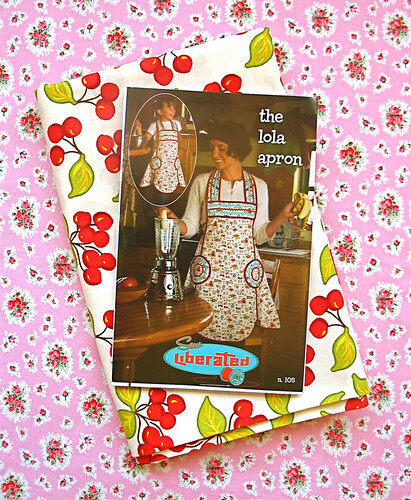 A Lola apron pattern and 1 1/2 yards of Sandi Henderson's fabulous Vintage Cherries print. I'll even throw in some of that pink Paris Bebe fabric for fun! Thank you for an exciting year! !